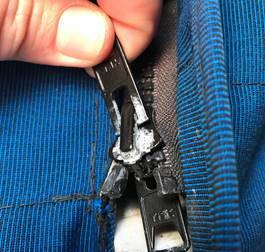 A quick fix for corroded zippers is popular with boaters this time of year, says BoatUS. Getting corroded boat canvas zippers to work smoothly by using two common kitchen items has never been so popular, according to Boat Owners Association of The United States (BoatUS). The national boating advocacy, services and safety group announced today the number one most widely viewed online “BoatTECH” how-to-fix-it tip this spring is author Don’s Casey’s simple saran wrap and vinegar repair: Zippers with metal slides have a bad habit of becoming frozen with corrosion even though the teeth of the zipper are plastic. If you use force, you'll ruin the zipper. Instead, stand the cushion with the zipper up and place a small rag soaked with vinegar over the corroded slide, cover the rag with a piece of Saran, and wait. The acidic vinegar will dissolve the corrosion and free the slide. The series of online how-to BoatTECH subjects at BoatUS.com/boattech can help boaters plan spring-commissioning projects or upgrades, from putting on bottom paint, replacing an impeller or performing sterndrive maintenance, to the more complicated installing an inverter or adding air conditioning. BoatTECH features are authored by top experts in their field as well as the editors of BoatUS Magazine. BoatUS also has a free Spring Fitting Out Safety Checklist at https://goo.gl/tmHe28.